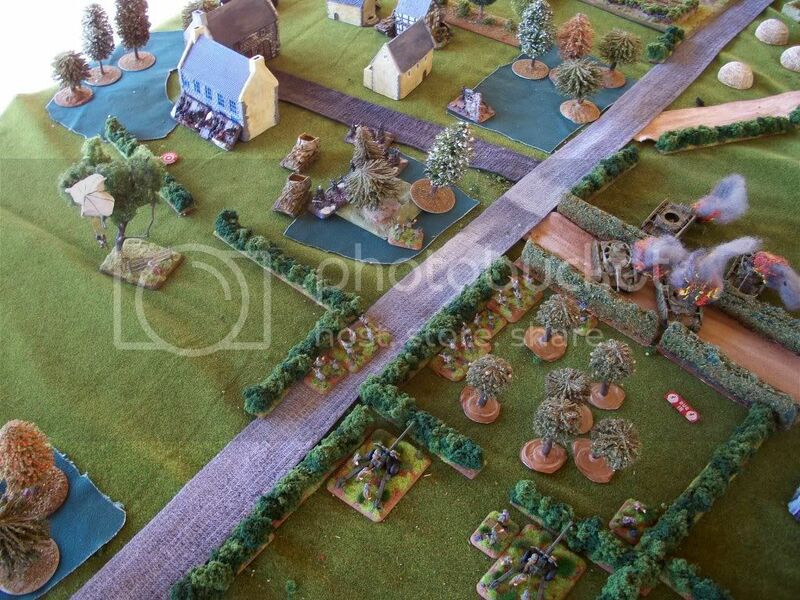 In game one of The Breville Gap AoA Campaign German forces were resoundingly rebuffed at Amfreville and forced to re-direct their offensive efforts toward the Bois de Mont region. A road ran through the centre of the battle field. In the centre left of the table (from the British edge) was the Chateau St. Come, across the road was the Mayor’s bungalow. As I forgot to bring my hedgerows we had to find some older hedges to use to flank the road to the bungalow. The rest was again largely made-up. Objectives are the destroyed tank just above the woods on the British right and the (by now thoroughly ubiquitous) “Parachutist hanging from tree” on the British left. Apologies for the few blurry pictures below: I binned most of the really bad ones. Click for larger versions. 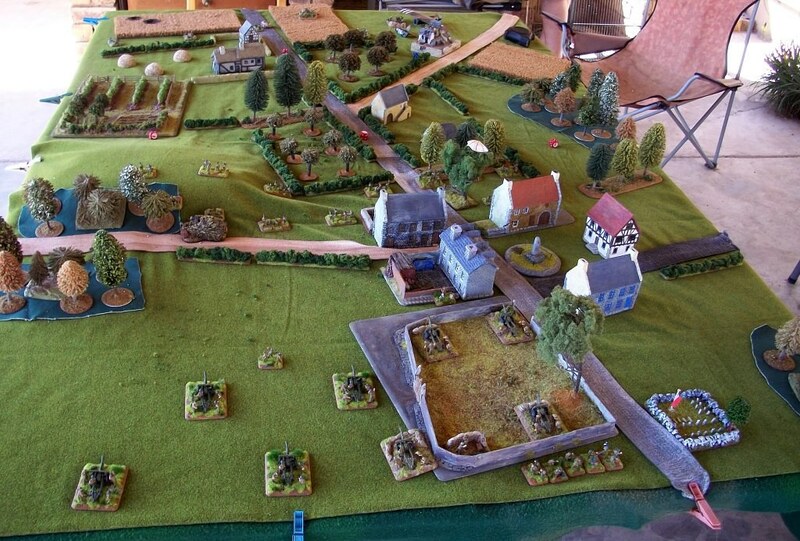 The battlefield as seen from the Commando deployment edge. 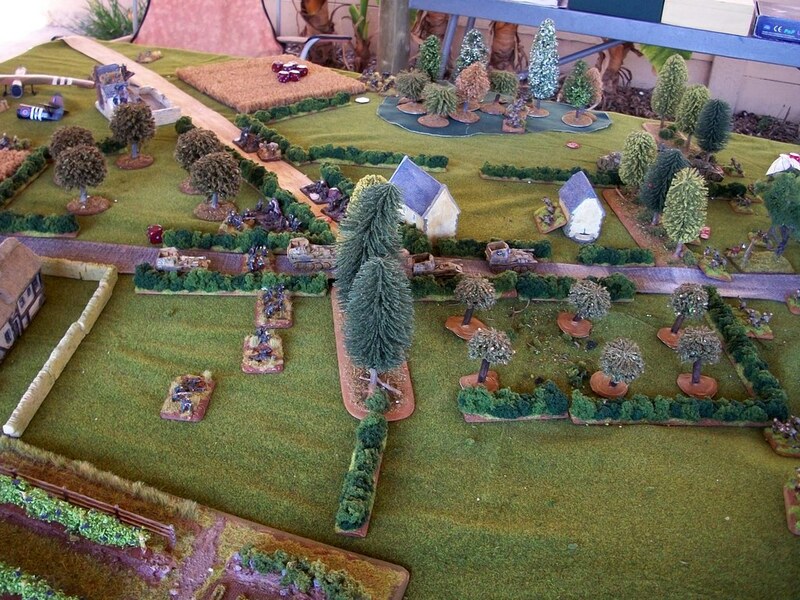 As I had an unchanged army I deployed the 25-pounders and two Commando Sections on-table, Airlanding 17-pounders in ambush again, the rest in reserve. 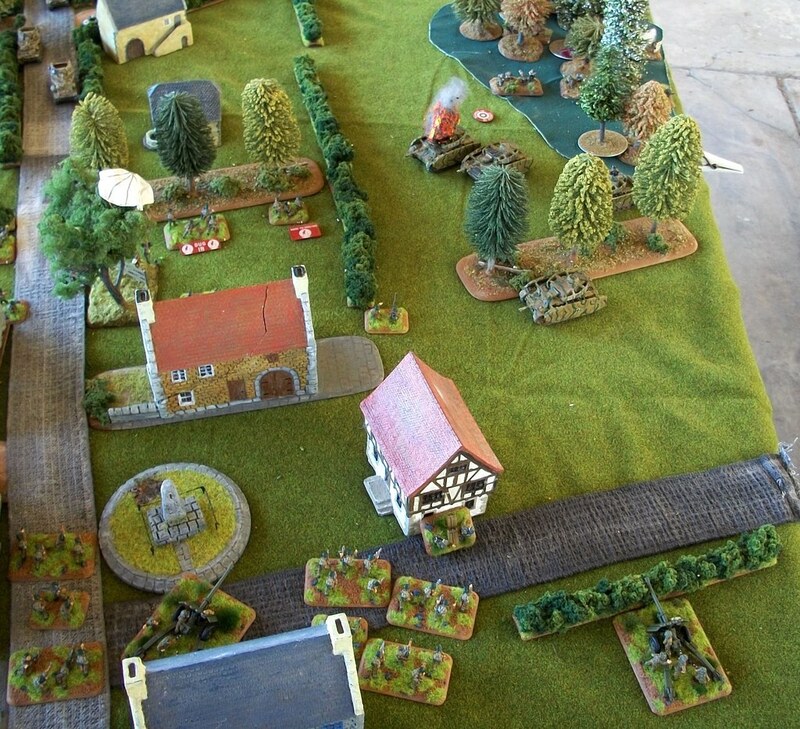 The German deployment. 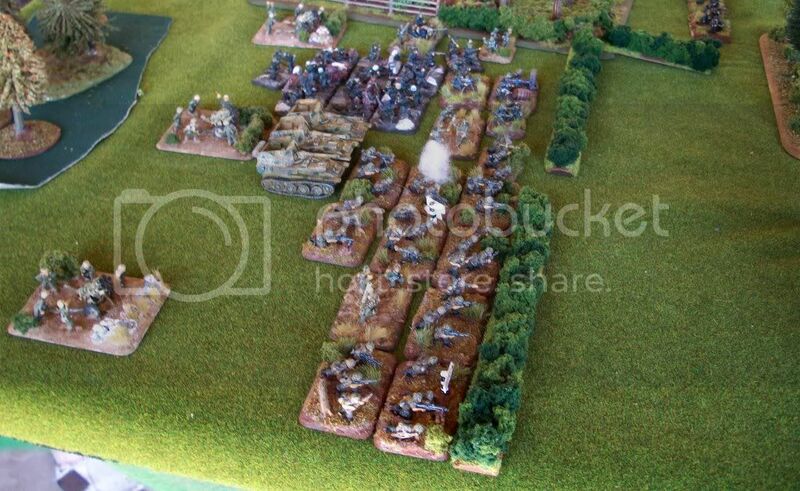 Colin dropped a Marder IIIM for a pair of 20mm FlaK weapons, boosted the Black Pioneers to 3 Squads and exchanged the HQ Mortars for a 1 Section Mortar Platoon. The German right. Fallschirmjäger proxing as Black Pioneers with flame-thrower. The German left. Grenadier with attached HMG and Panzer IV platoon. Turn one the Germans advanced, 2 Grenadier platoons, the Pioneers, MG platoon and Marders on the German left. 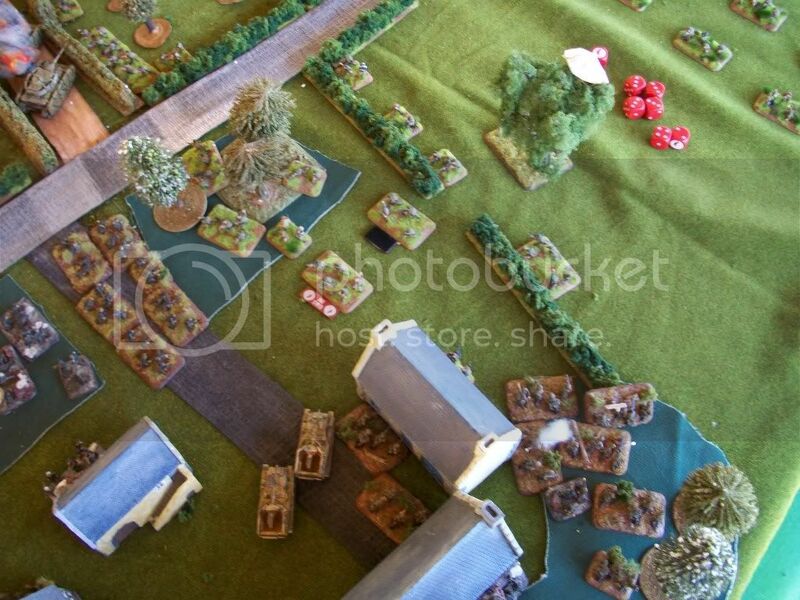 On the right the Pz IVs move onto the hill while the Grenadiers on that flank sought the covered approach of the wood. 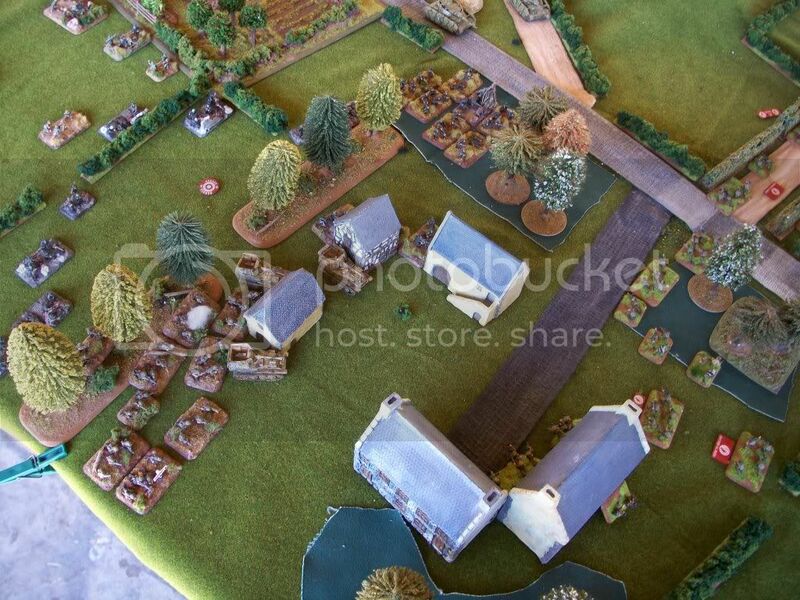 Turn two saw all German platoons un-pinning and surging forward to take the Chateau. 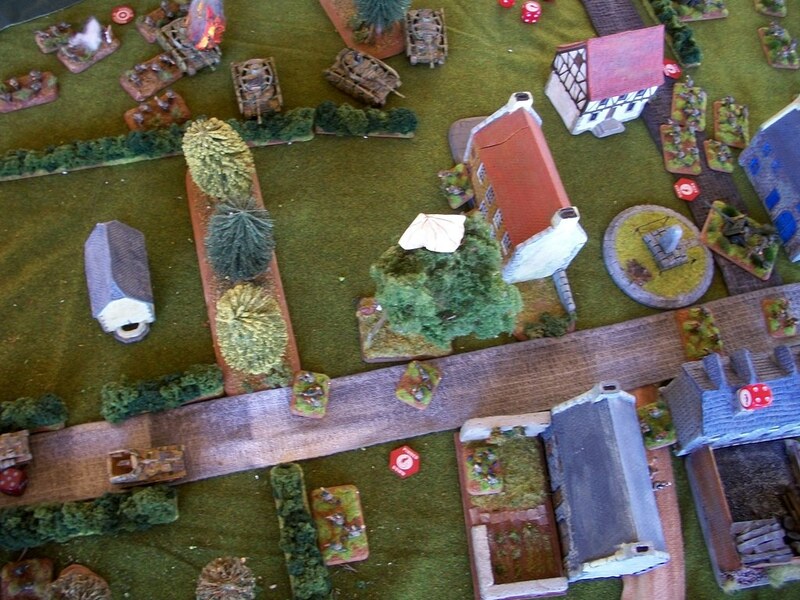 Sporadic MG fire had no effect and the Mortars and Nebelwerfers failed to spot the GtG Commandos. On the German right the Pz IVs did nothing much while the Grenadiers moved deeper into the woods on the way to take the Mayor’s bungalow. The RAF also showed up and hit several teams from the Grenadier Platoon in the woods on the German right, only destroying one. 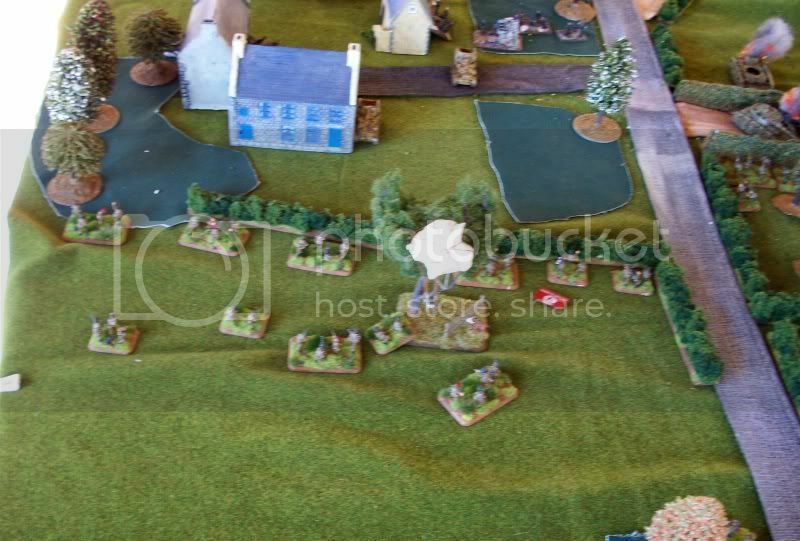 Turn 3 saw the Pioneers fail to un-pin, while the two Grenadier platoons sought cover in the woods and outlying buildings of the Chateau. 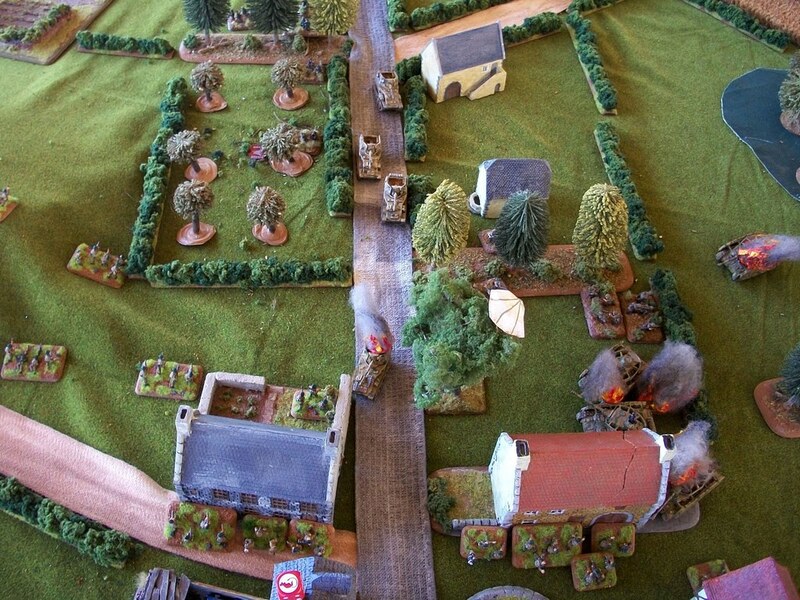 A Grenadier platoon in the centre was in position to assault, but German template weapons either failed to rang-in or failed to hit. Scattered MG fire is likewise ineffective and with insufficient cover fire, the assault is postponed. ...but the consolidation move will do them in. 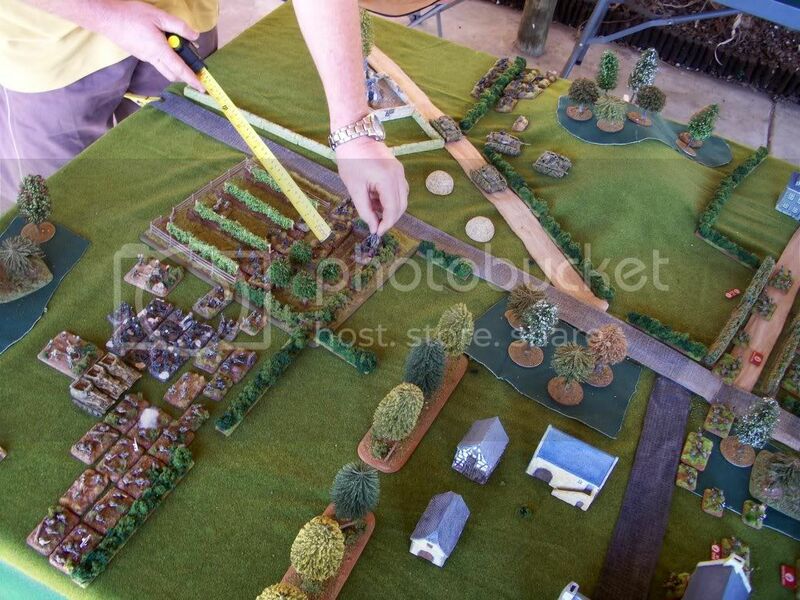 In my bound I deploy the Airlanding 17-pounders from Ambush behind the orchard (we use 12” LOS for normal orchards, otherwise treat thicker orchards simply as woods). No Air support but the Airlanding Platoon doubles on from reserve on my left. The Commandos section in the orchard un-pins and moves up for the inevitable assault on the survivors of the Pz IV platoon, the other Section stays GtG. 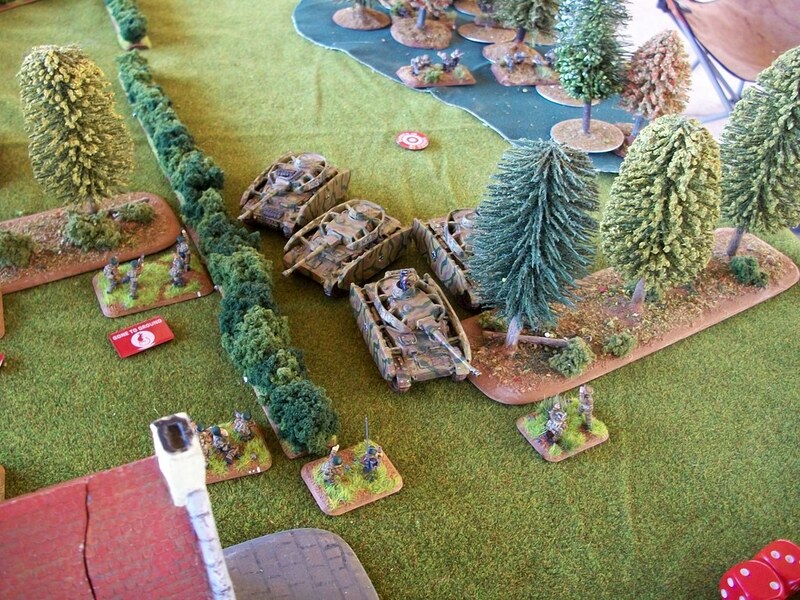 Artillery fire in ineffective, but 17-pounder AP rounds scream through the hedgerows to KO the two visible Panzer IVs, the Commando Section finishing off the last bailed tank in assault. Turn 4, Grenadiers and Marders move up to provide supporting fire, the former intending to assault. The Black Pioneers with German CO attached un-pin and also move up to assault positions (lower right in picture above), the flamethrower targeting the house. Fortunately (for me) Colin rolls a 1 and 2 for his skill tests, but Nebelwerfers succeed in pinning the Commandos. 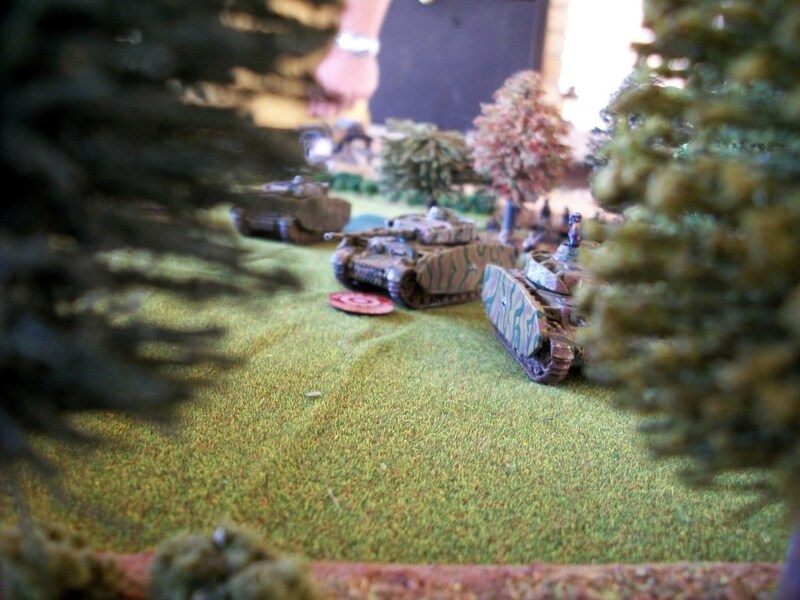 ... while the Commandos counter and destroy four pioneer. 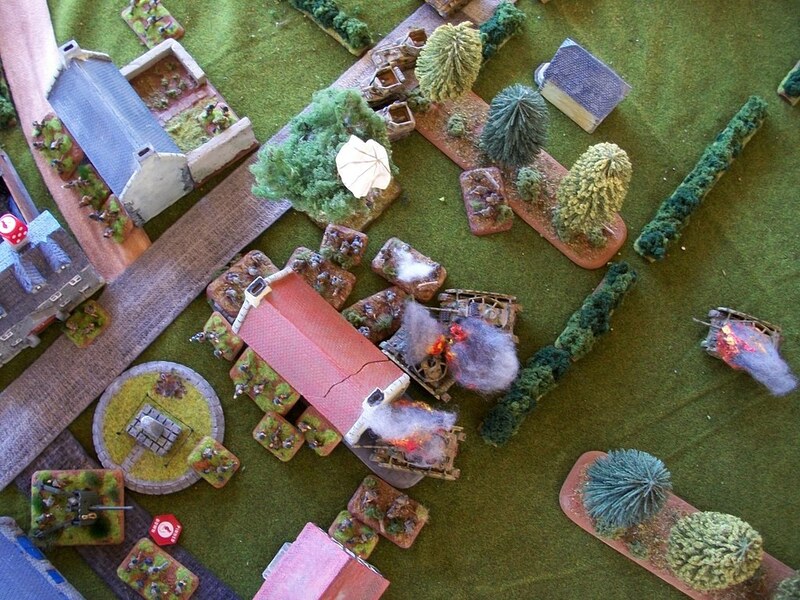 The Pioneers counter again and destroy the 25-pounder observer, but are them wiped-out by the Commando counter-assault. 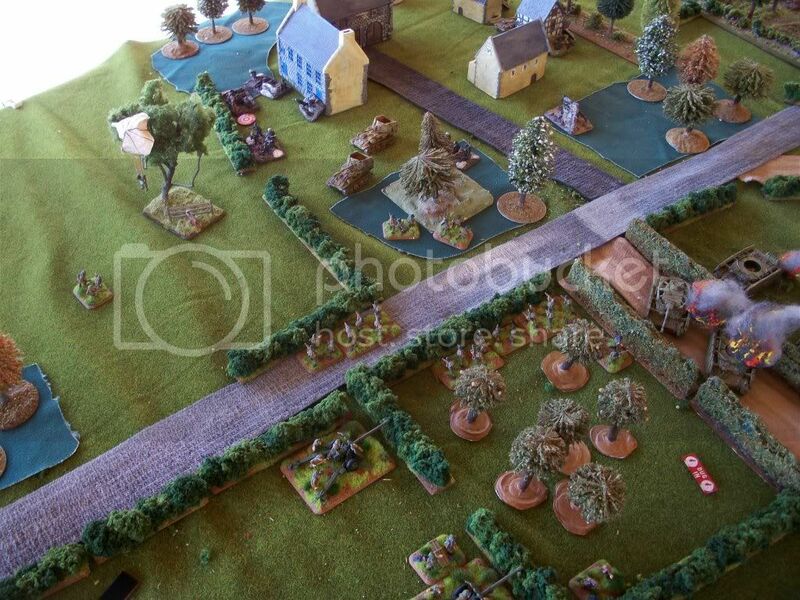 ...and I consolidate by pulling back out of assault range of the waiting Grenadiers and taking cover behind the hedge. 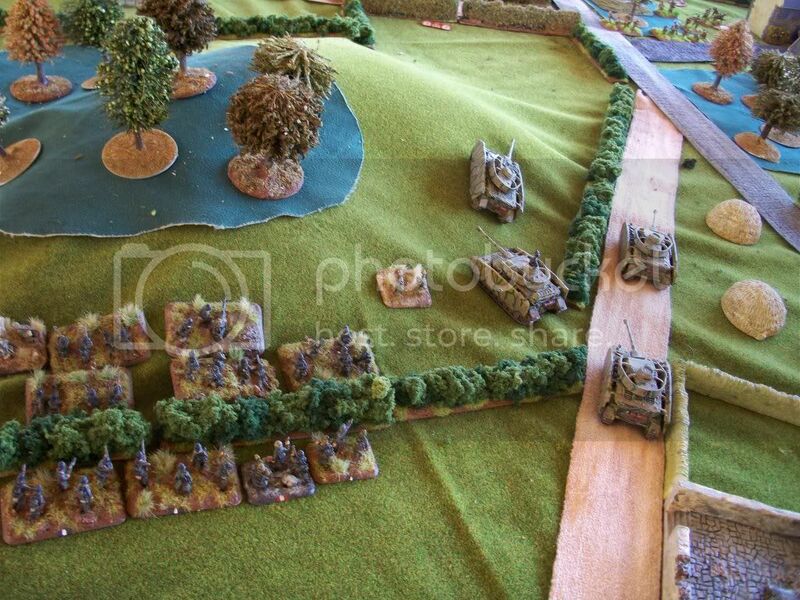 On the British right the Grenadier platoon in the woods finally emerges to line the hedge, a little too late to support the Panzer IVs. In my bound, no air, no reserves, the Airlanding platoon moves up to support the Commando Section in front of them. 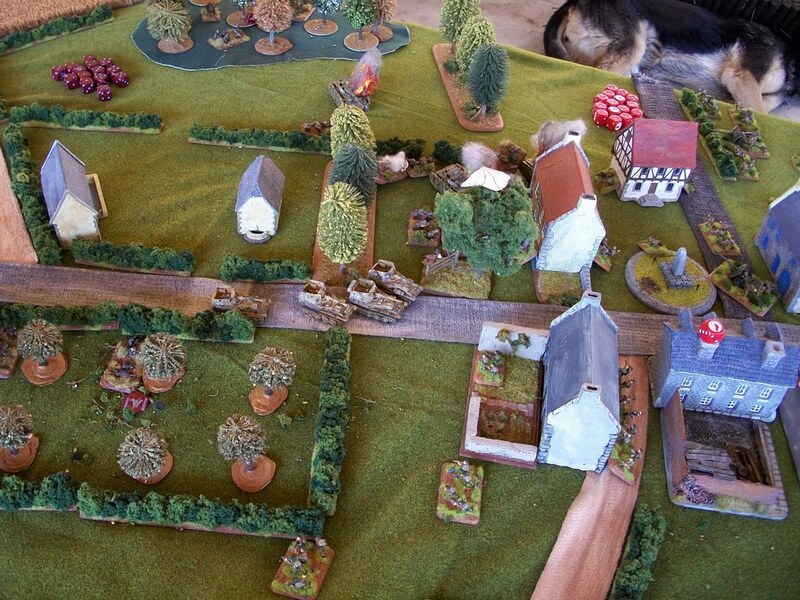 The Commando section un-pins and, noticing the lone German Company commander in the lower left hand picture, puts him out of his misery. 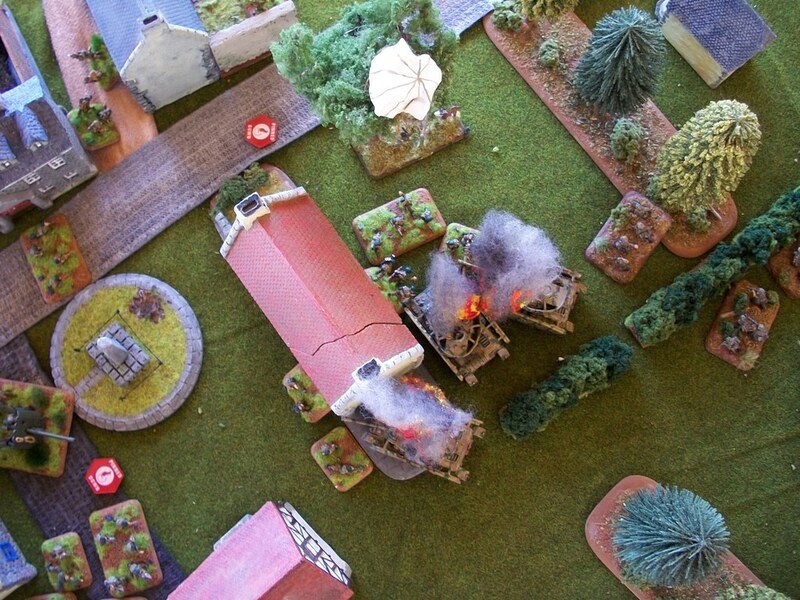 Artillery fire kills a base on the British right, but nothing else. Turn 5, the Germans open fire on the Airlanding platoon, scoring eight hits. 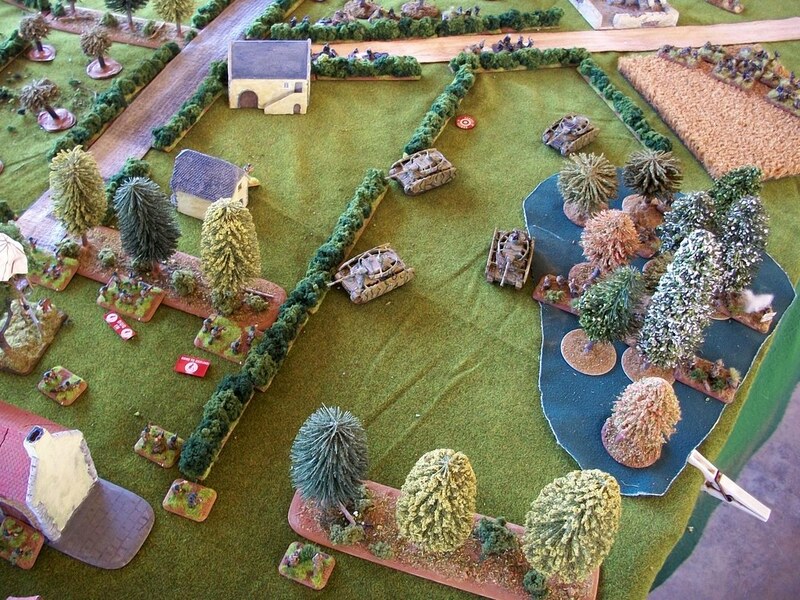 I respond by rolling FIVE “2s”...the remaining three are assaulted and destroyed, while Marder MG fire hits two Commando bases lining the hedge and I fail both saves there as well! From things looking secure they now look quite difficult as I only have one viable Commando Section on-table, the other left with just one base. 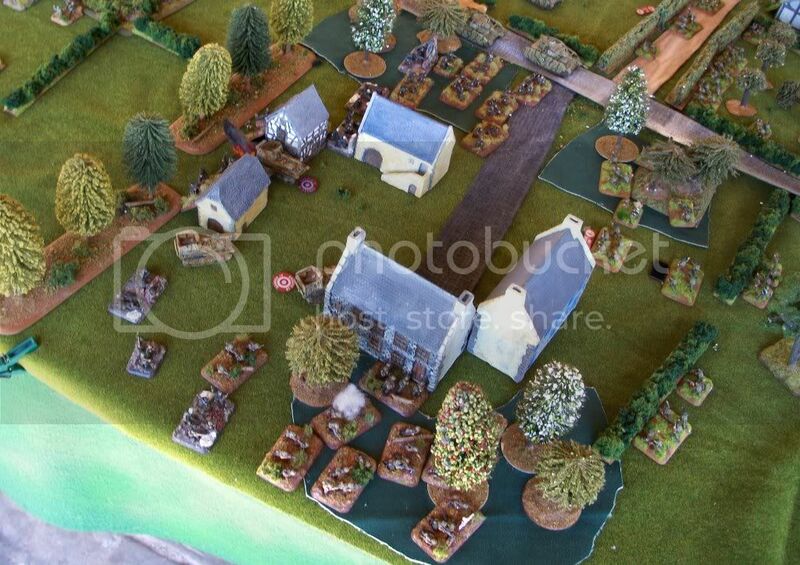 The Germans consolidate back behind the hedge, contesting the objective. 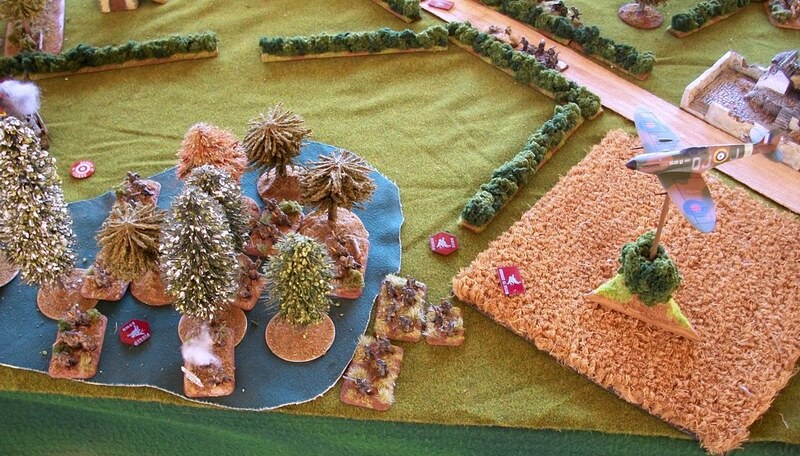 My half of turn five I pull the Sole Survivor in to the woods hoping to keep him alive, move up a 25-pounder battery commander to contest the objective and move several bases from the viable Commando Section to within 6”. 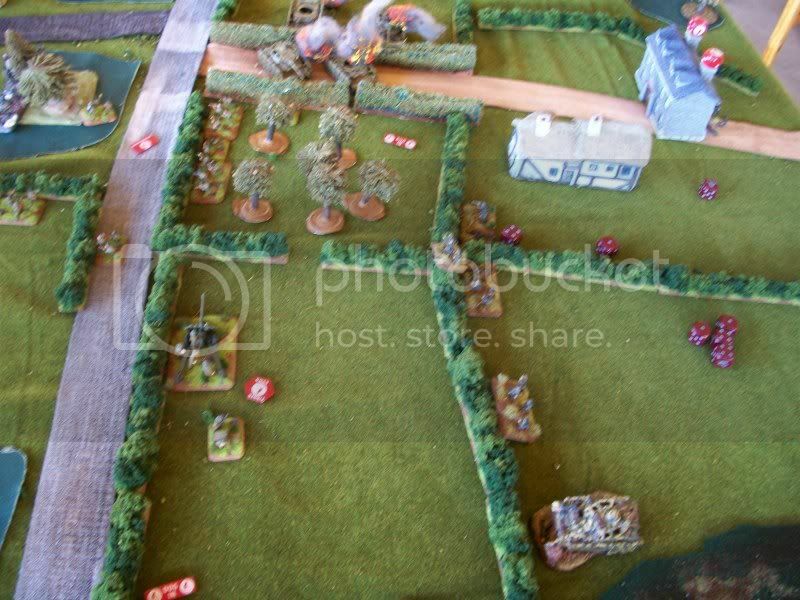 Artillery fire pins the Germans, but does no damage. Turn 6 Colin pulls his grenadiers back into the houses or woods and kills the Sole Survivor from the battered Commando Section and the Battery commander contesting. Long-range Marder fire also KO’s a 25-pounder. The Grenadiers on my right still advance very cautiously through the Mayor’s Bungalow, occupying houses but advancing far too slowly. No air, but two Commando Sections comes on from reserve, one through the woods on my right, the other badly-needed on my left. The on-table Section moves to contest the left-most objective. 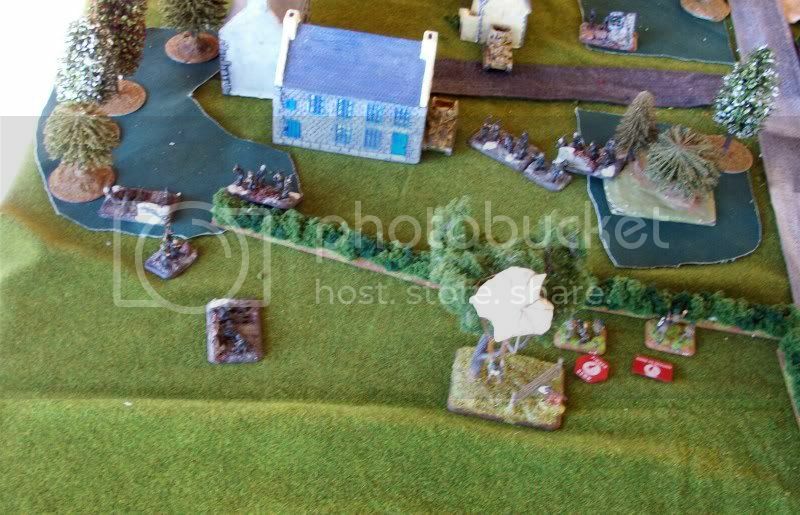 The 25-pounders split fire, half the battery pinning the Grenadiers in the Chateau, the other half firing at the Marders, knocking-out one and causing the third to flee. Down four platoons the Germans are near breaking point. 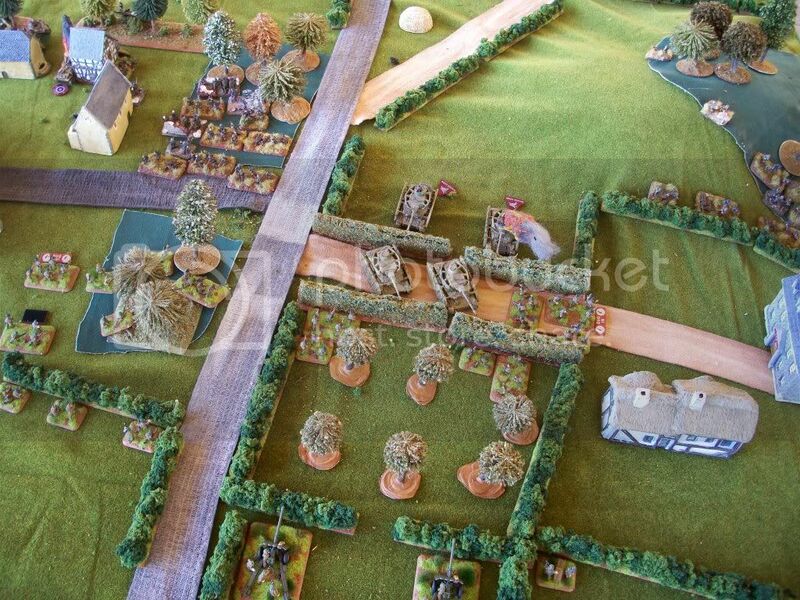 Turn 7 sees very little German activity. My shooting is ineffective and I can’t be bothered to risk an assault before I have another platoon on the objective. 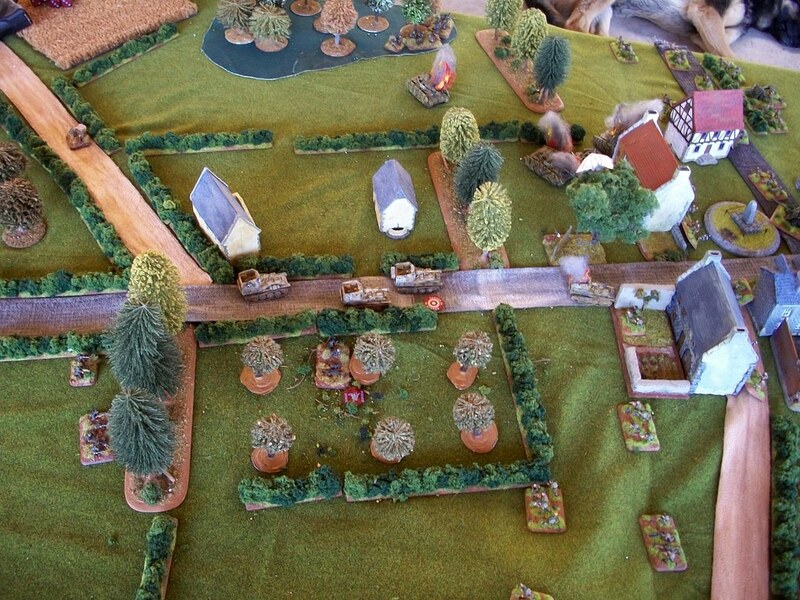 Turn 8, a last ditch German assault sees a 17-pounder and observer killed, the command teams pulls back to preserve the platoon. My shooting destroys this last platoon, putting the German Company below half and with no CO, they flee the battle field. Commandos hold the line at Bois de Mont! 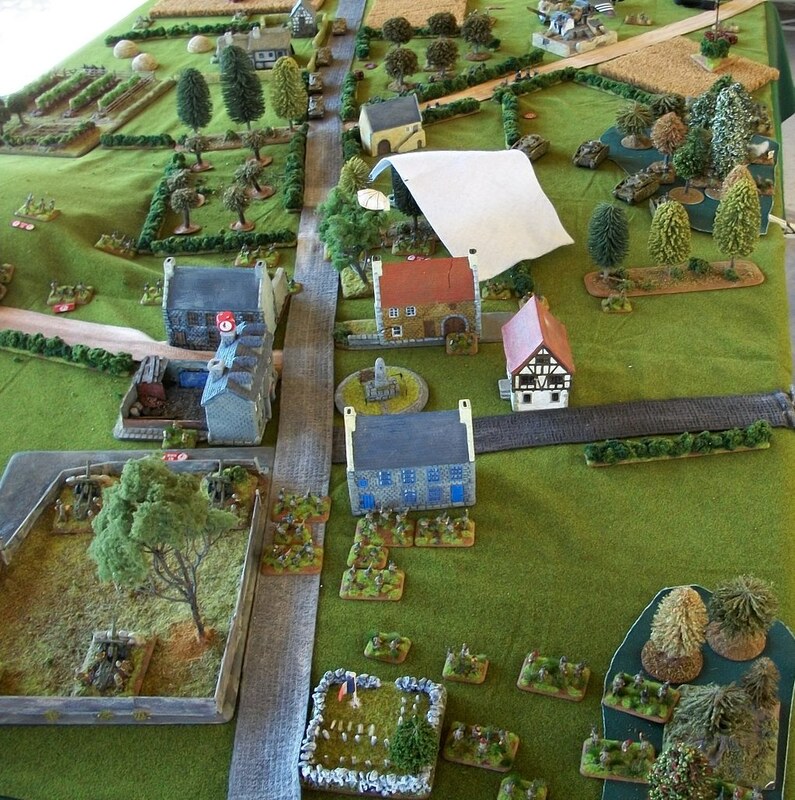 With both attacks having failed, the next game will see British forces in the region moving to attack the town of Breville itself in an attempt to eliminate the German salient once and for all. I made a few mistakes in this game, most notable not using the SMG swap-out in the Commando sections. When simply defending this is not too much of a handicap, but there were several instances where if I had the SMG teams I would have been assaulting German platoons, templates never being completely reliable. I also need to get my Airlanding 6-pounders painted as the 17-pounders are too one-dimensional to fit into my Commando force. Drop the Air Support, and fit in the Vickers MMG troops as well. So a mate and I had been talking of doing an Axis of Attack campaign for a while now (read months and months). Since we both had forces which would fit the area and combatants fairly well, we went with The Breville Gap campaign on pages 48-52, D-Day. This covers German counter-attacks after the D-day landings and the 6th Airborne Division’s drop in the Orne Bridgehead area. German forces have managed to successfully hold onto the town of Breville and from there will launch counter-attacks in an attempt to re-take the bridges over the Orne River. The British naturally want to prevent this from happening and in turn eliminate the Germans in Breville. Since the 1st and 4th Special Service Brigades were actively involved in the area I would be fielding No. 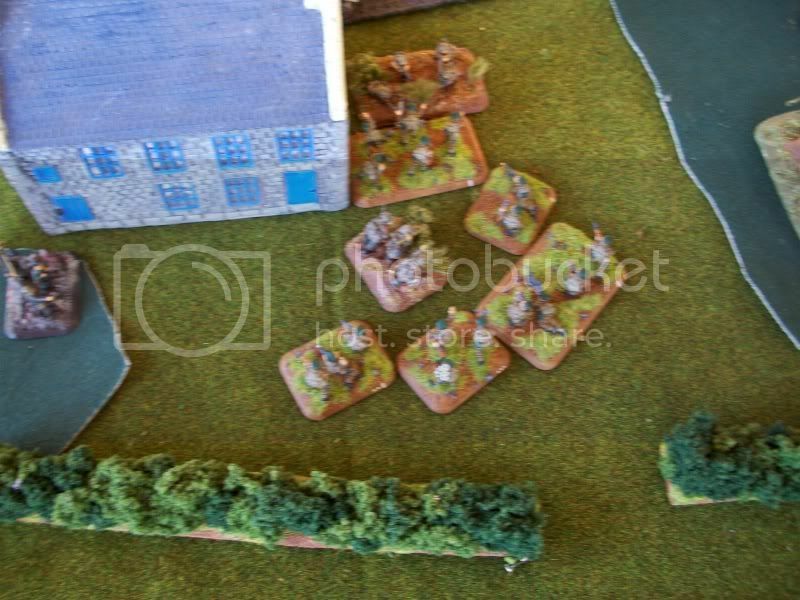 6 Commando from the Commando PDF on the FOW Site, using the “Orne Commandos” list. Colin would be fielding Grenadiers (ostensibly 346. Grenadier Division) from Fortress Europe. Both armies were set at 1750 Pts. In the campaign the Germans have the option of attacking out of Breville towards either Amfreville or the Bois Mont region. If their first attack fails, they may declare it to have been a diversionary attack and attack again in the other region instead. 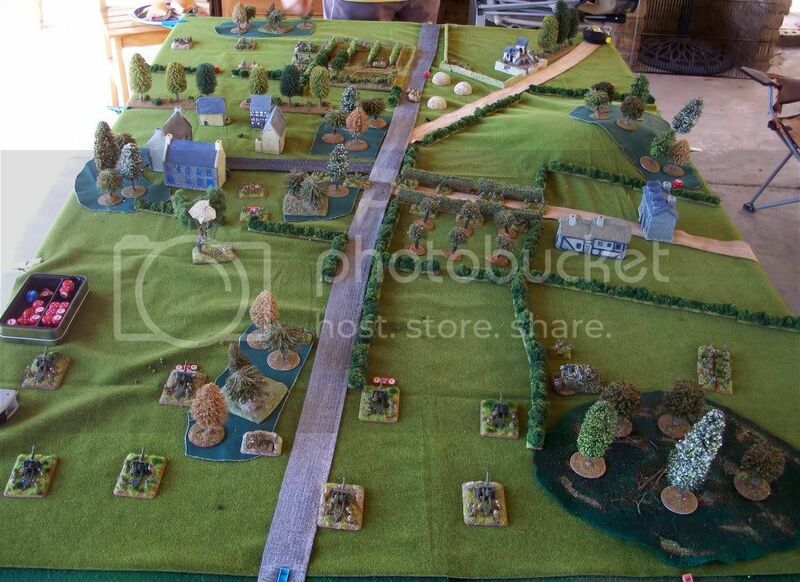 Colin elected to attack Amfreville up first, so we set up the table using the (very short) terrain guide in D-Day. 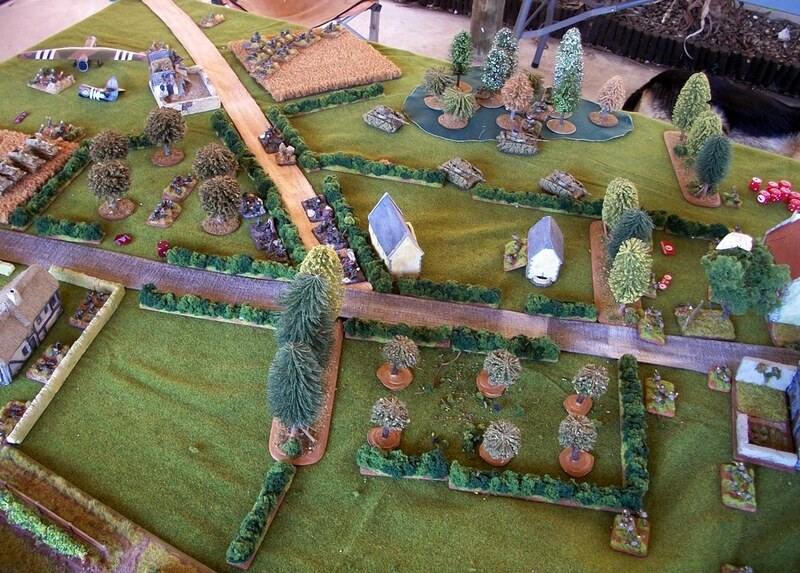 The Germans would be attacking in a No Retreat Mission. The village at the top represents Amfreville. The terrain brief notes a few farms scattered along a road running from one table edge to the other, the rest was largely made-up. Also we had to discard much of the “pretty” terrain: an annoyingly strong wind kept blowing over anything which was not weighed down. Initial Commando deployment: Full 25-pounder Battery, a 2-Section Troop and the Airlanding 17-pounders in ambush. 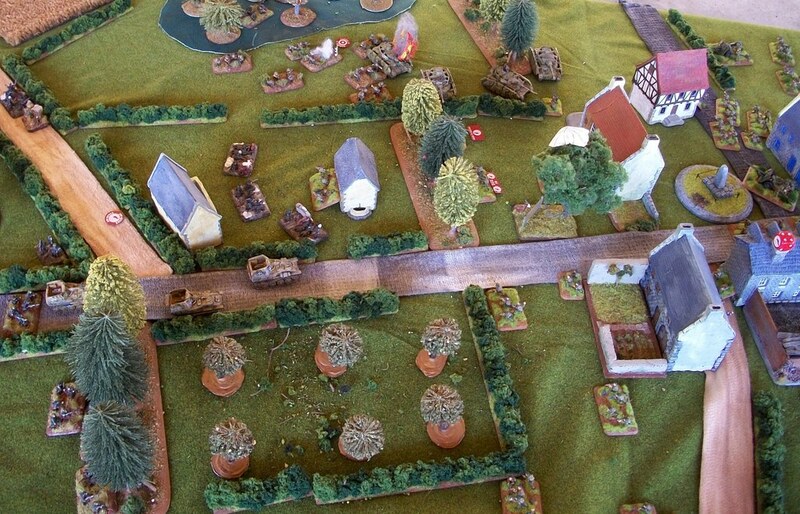 Off table were two more Commando sections and an Airlanding platoon. 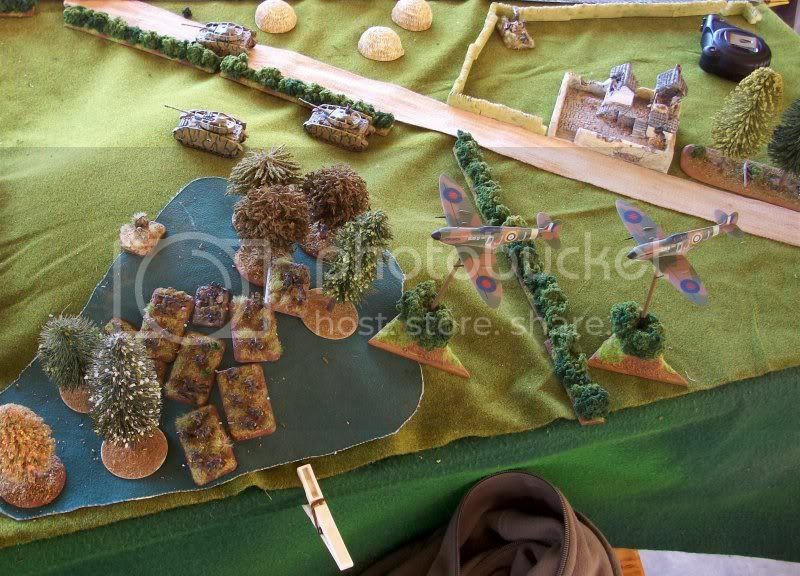 The British also had Limited Air Support (Typhoons) Objectives are the destroyed tank on the left on the reverse slope of the hill and the cunningly disguised tree (with hanging parachutist) in the centre-right. Independents teams at the bottom, waiting to deploy. 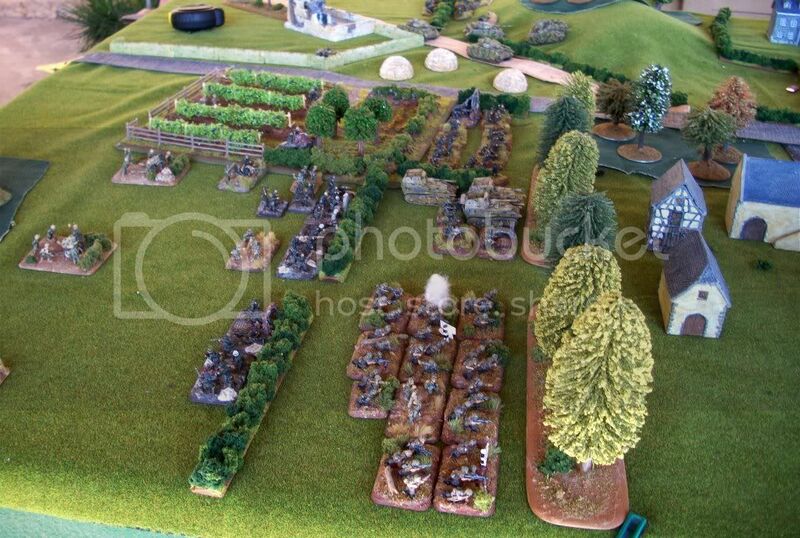 The German Deployment: (from left) Grenadiers, HQ Mortars, Panzer IVs, 2 Squad Black Pioneers, more Grenadiers, Nebelwerfers, Marders, more Grenadiers & HMGs, 7.5cm Infantry Guns. 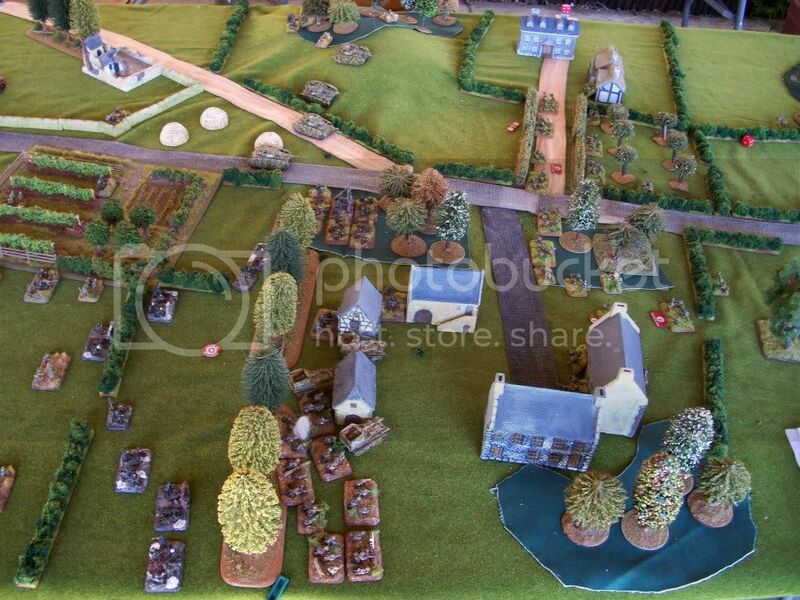 The first German saw movement across the board, Grenadiers advancing everywhere, Marders hanging back a little and PZ. 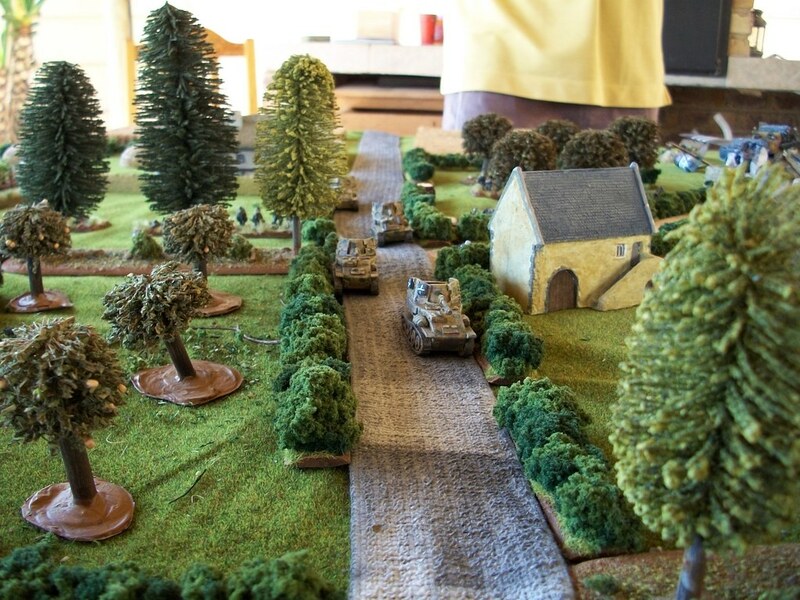 IVs attacking up the German left flank with Black Pioneers moving in to the woods on the German far left, another platoon of Grenadier following. German artillery failed to find targets. Artillery hit a Pz. IV but I failed FP, Air failed to range in and everyone else stayed GTG. No reserves. Turn 2 saw the Germans advancing aggressively up their left with Black Pioneers and Pz. IVs. 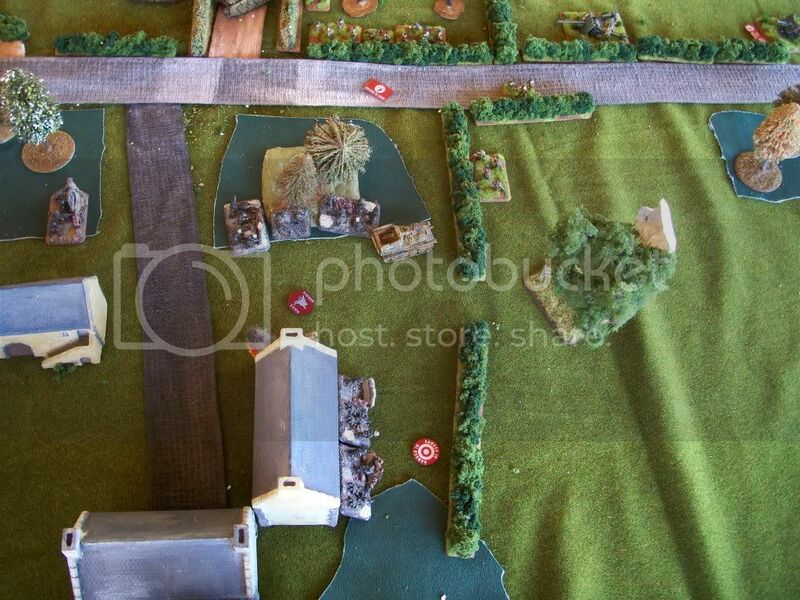 Grenadiers continued to advance slowly through the centre orchards into the road fork. Maders moved down the centre road. Nebelwerfers smoked the centre observer and my right-most Commando Section but placement missed the 25-pounder observer (behind the tree-line on the right). MG fire from Pz IVs is ineffective. In my bound the Airlanding Platoon and a Section of Commandos come on from reserve, the latter doubling. Half the 25-pounder battery ranges in on the Grenadier on the centre road fork, pinning them down and killing a base. 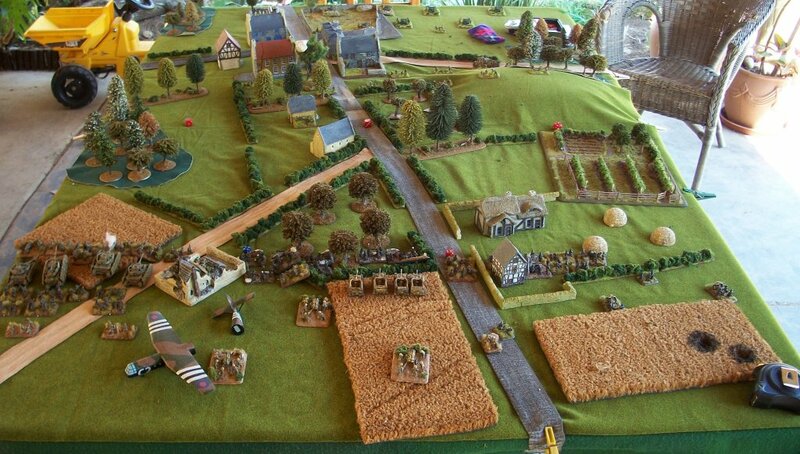 The other half of the battery failed to find any targets from the sea of Germans in front of them! 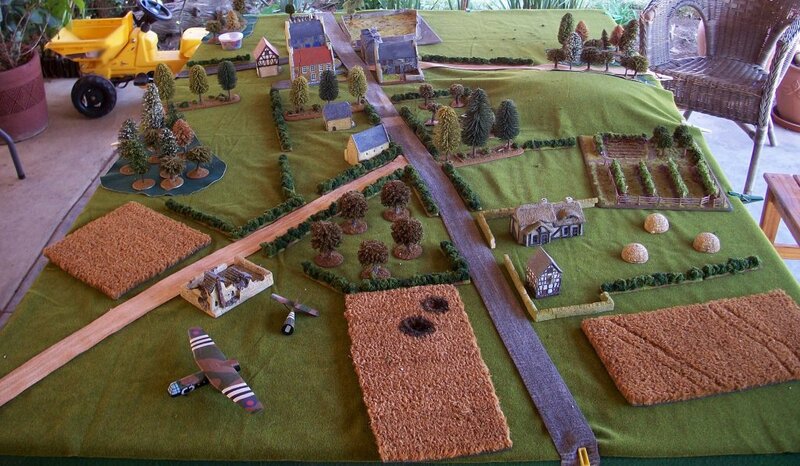 Air provided one aircraft which spotted a Grenadier platoon advancing lethargically up the German left. Despite needing re-rolls I ranged-in on the first attempt, had the entire Grenadier Platoon under the template and one from the Black Pioneers. 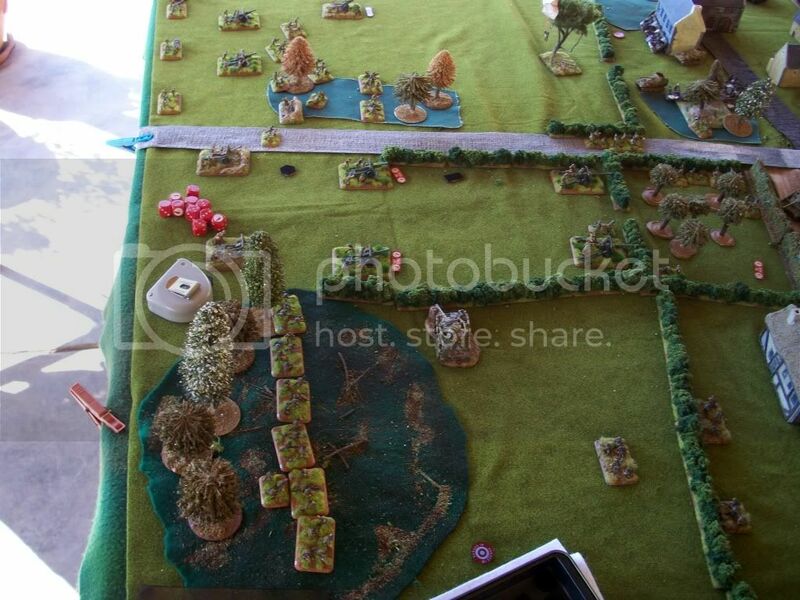 I hit the latter, and killed an attached HMG and two infantry from the Grenadiers, pinning both platoons. A view from just above the head of my 25-pounder observer and the ranged-in marker. Turn 3 and German infantry across the board fail to un-pin, the 4th (rightmost) platoon beginning to advance where the others have stalled. Marders creep forward a little closer. Nebelwerfers pin the centre Commando Section. Frustrated, Colin launches the Pz. 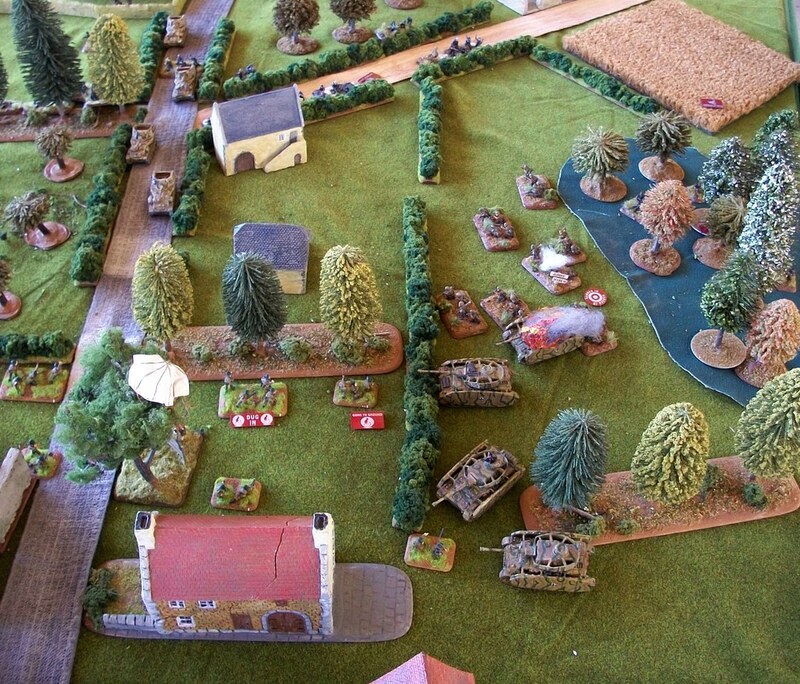 IVs against the Commando Section on the centre objective (above) who also have Peter Young in tow. No reserves. I respond by ambushing with the Airlanding 17-pounders and moving previous reserves up further. 17-pounder fire is terrible: only one Pz. IV is hit and KO’d. 25-pounder drop shells on the road fork, killing two bases. Other artillery fire hits the Black Pioneers but causes no casualties. 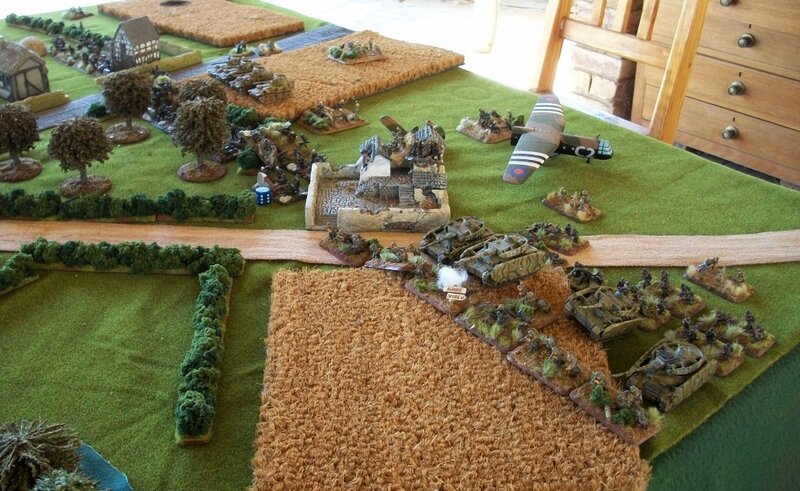 One aircraft comes in again, deciding to pick on the still pinned Grenadier platoon at the back. Strafing successfully takes out another two bases but the platoon passes motivation and later moves to hide in the woods. 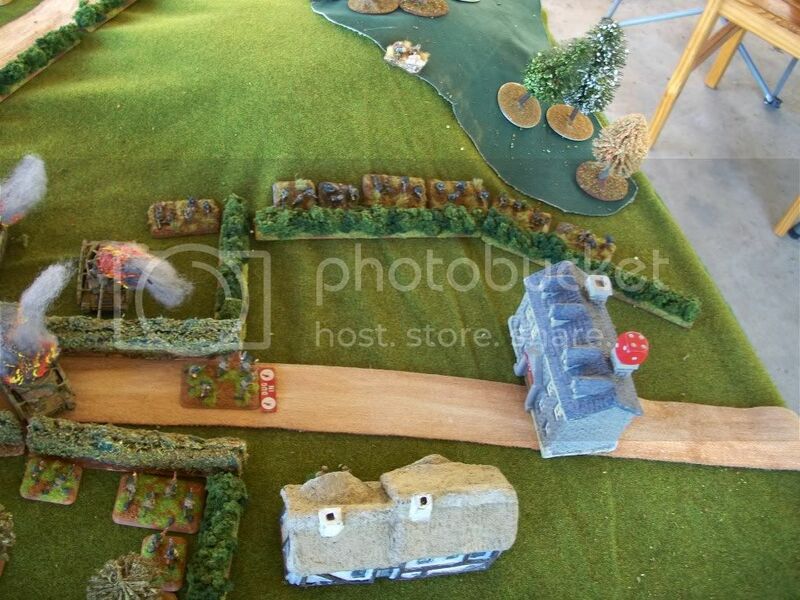 Turn 4 saw the German infantry un-pin across the board and get moving. 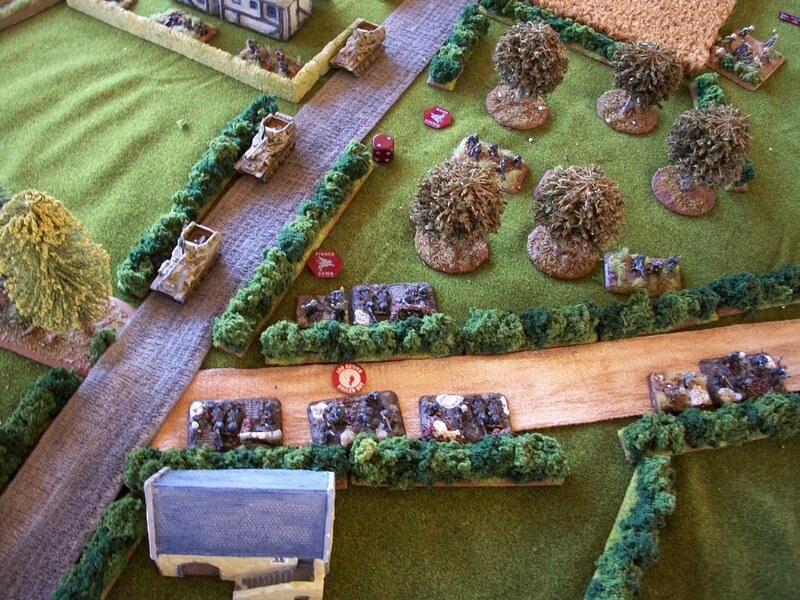 The reduced Grenadier platoon in the centre moved up to assault the Commandos who still held a house in the farm, while the Pz IVs and Pioneers also moved up intending to get to grips. Combined Nebelwerfer, Mortar and MG fire pins both Commando Sections. 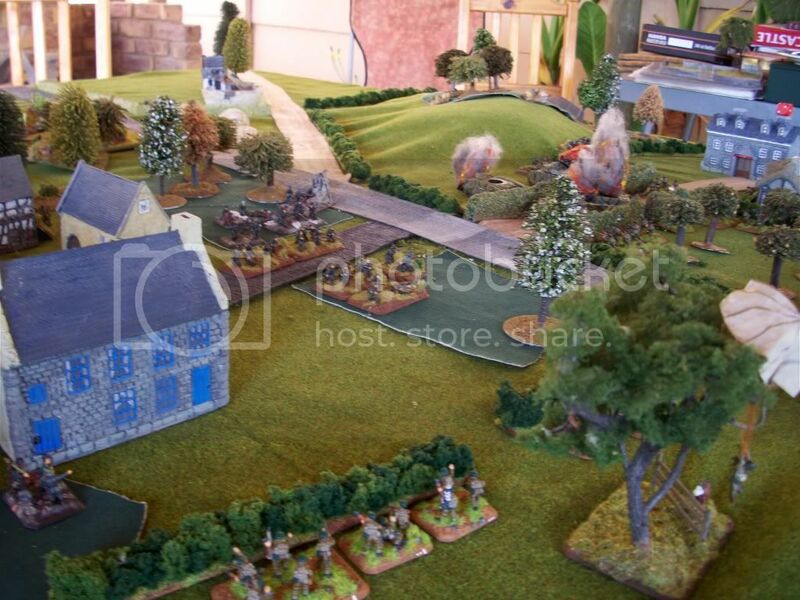 The Grenadiers in the centre assault, eliminating the base in the farmhouse but then are decimated by the counter attack, quitting the field. The Pz IVs then assault and destroy the 25-pounder observer. Commandos counter, KO a Pz IV. Tanks counter, pass bog checks to fight teams in the house (!) and destroy another team. 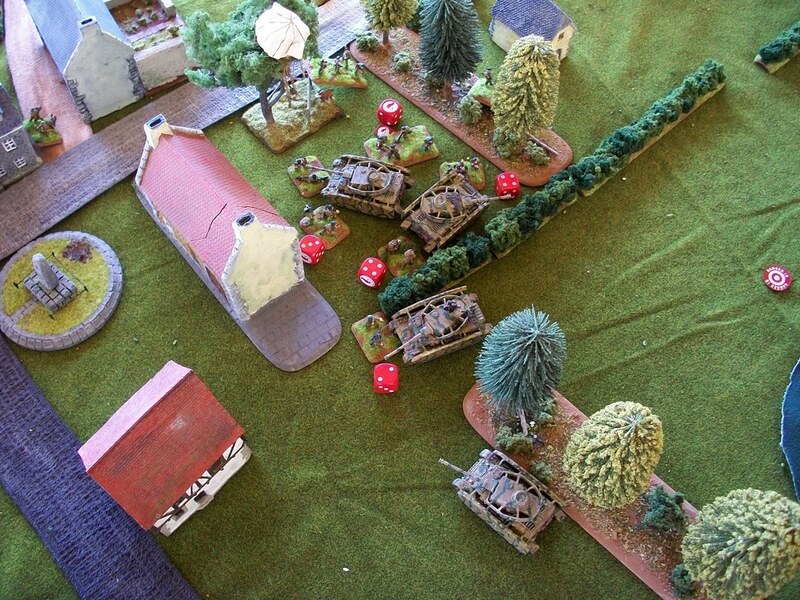 The Commandos then destroy the PZ IV platoon (the PIAT gunner finally wakes up) and pull back into the broken red-roofed house, passing motivation. The Pioneers advance using Shooting Was Too Successful to (mostly) line the hedge. In my bound 4 another Commando Section arrives from reserve on my left. 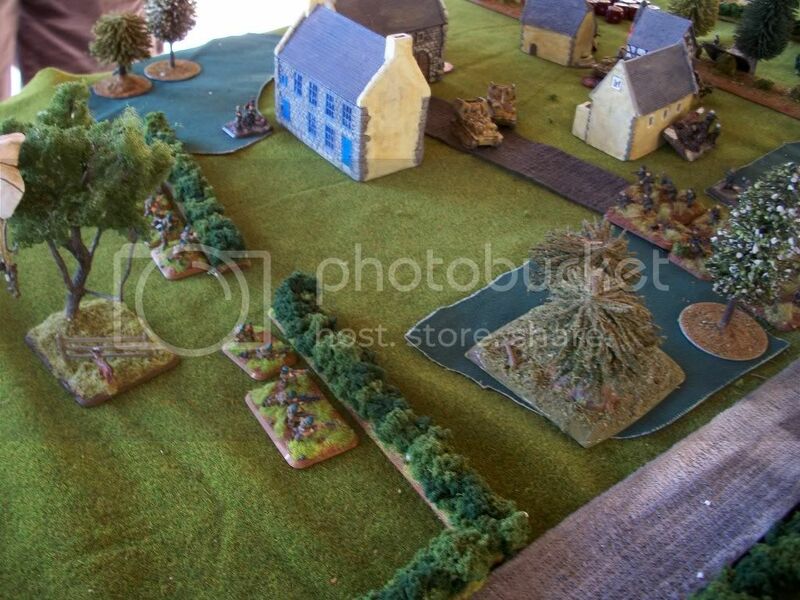 My left-most Commando Section, having had nothing to do all game, opens a withering fire on a Grenadier Platoon in the orchard in front of them, killing three grenadier bases and pinning the palatoon. 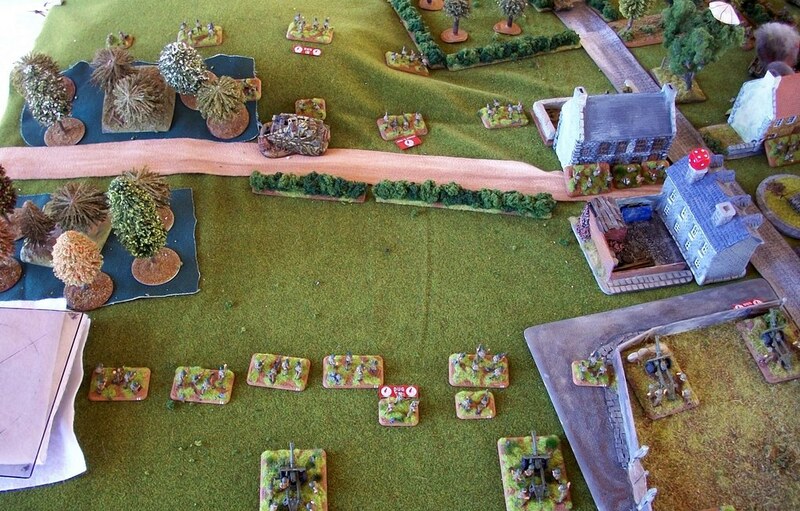 Turn 5 sees the German infantry fail to un-pin, Marders move a little further down the road and KO a 17-pounder. My bound five shooting is mostly ineffective. Turn 6, Pioneers un-pin, move forward to assault with Flame-thrower in-tow. 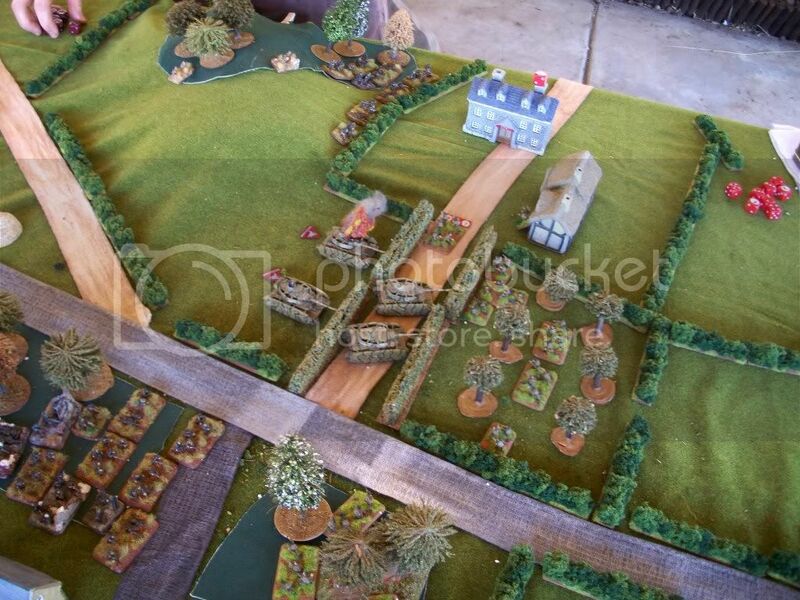 Marders also move forward to the edge of the village. Nebelwerfers pin the Commando Section. 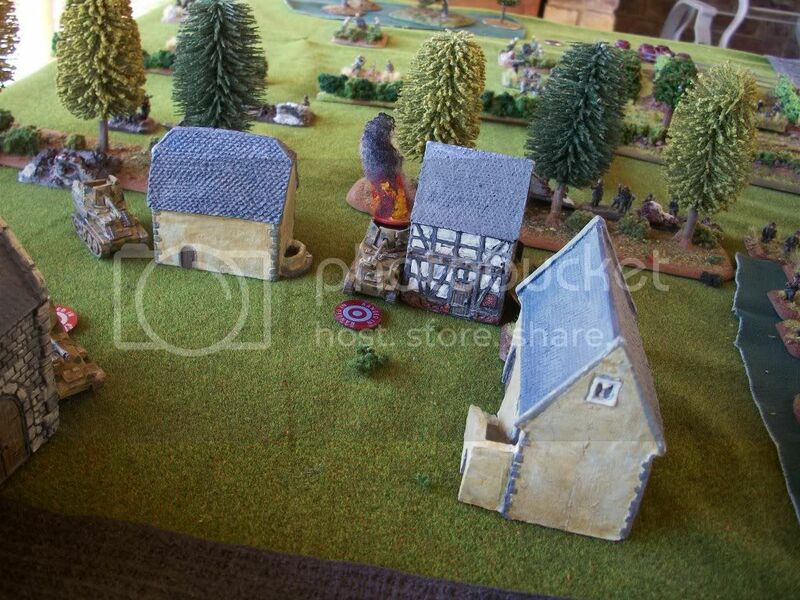 Unfortunately (for the Germans) the Flamethrower is too far back to fire, but the assault goes in anyway. Defensive fire drags in the Commando Section to the left of the main assault, pinning the Pioneers and destroying three bases. 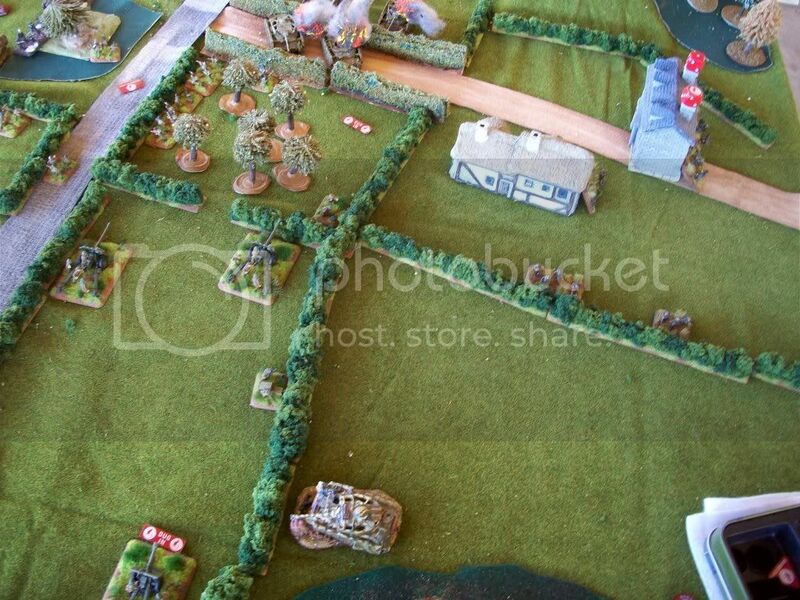 In desperation the Marders assault, take a PIAT hit (which bails one) and are driven off by defensive fire. 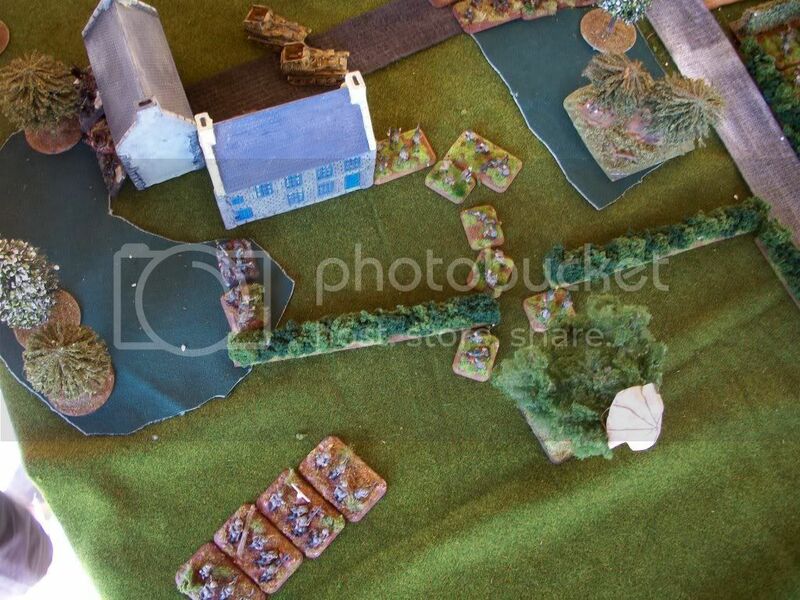 My half of 6 sees the Pioneers wiped-out by Rifle/MG fire, artillery annoys the Marders and the Airlanding platoon hunts down the surviving Grenadiers at the top of the picture. 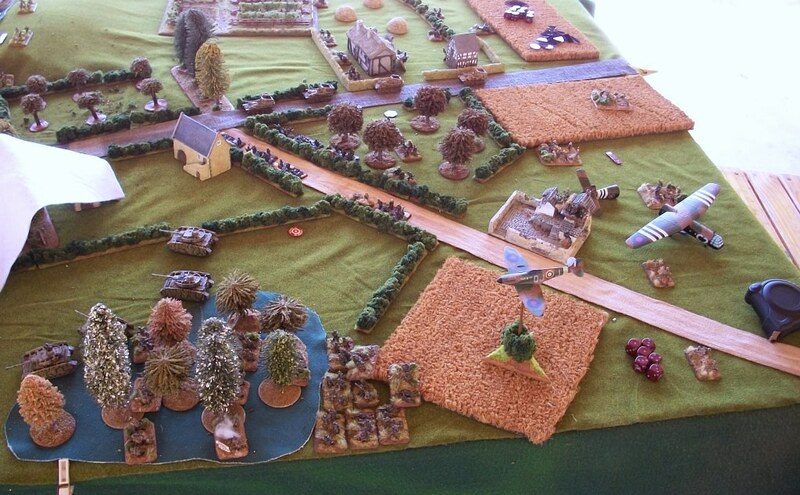 With no CO and more than half platoons destroyed, the Germans quite the field. Amfreville remains in British hands! German high command’s official line was that this was the “diversionary” attack, despite heavy casualties. The real thrust will take place next game in the Bois Mont region.